You know it’s there, just lurking in the shadows or even hiding in plain sight. The winter brings with it a lot of cold, cloudy, rainy, and snowy days, so use that inside time wisely so you can enjoy the spring weekends when they get here! Set aside just 5 minutes of each day to de-clutter. Or, choose one small de-cluttering task to do each day. Set a timer and chuck a few items into the Good Will bag. Did you know 5 minutes is less than the average TV commercial break? Commit to cleaning a space. Pick on section of your home and de-clutter it in one fell swoop. Don’t overwhelm yourself, just select a small area you can finish in one sitting. This could be a corner in your living room or one shelf in a closet. There is no right or wrong answer to these questions, but the answers you provide will help quickly decide if you need to keep that item or not. Before you start hauling trash bags to the curb, think about what could be recycled or reused, not by you, but by others. Thrift shops are always looking for used clothes and there are plenty of children’s winter clothing drives when the temperature starts to drop. Ask your friends and family to see if they are in need of anything that is going out the door. This way items that are useless in your home can be useful items in someone else’s. These tips are designed to clear up your cluttered home with little fuss, stress, or mess. Take your time, conserve your energy, and keep your spirits high. It’s easy to get overwhelmed if you bite off more than you can chew, so it’s important to pace yourself and take small bites out of your clutter every day. 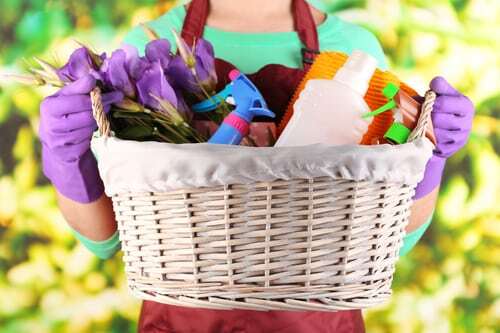 Before you know it, your home will be clutter free and you can spend your spring relaxing in the sun instead of frantically cleaning your home.